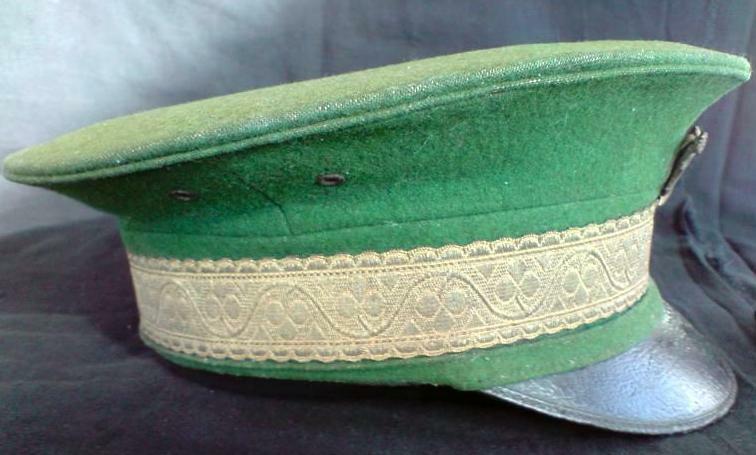 A friend and collector has supplied us with photographs of a Cork Volunteers cap,very nice quality and condition. Many thanks to Daniel Hulin. An article posted by Irish author and historian Padraig O Ruairc. Thanks Padraig. 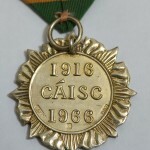 Re-enactors have been asking me for some time about Irish Volunteers / I.R.A. uniforms and what is and is not accurate. 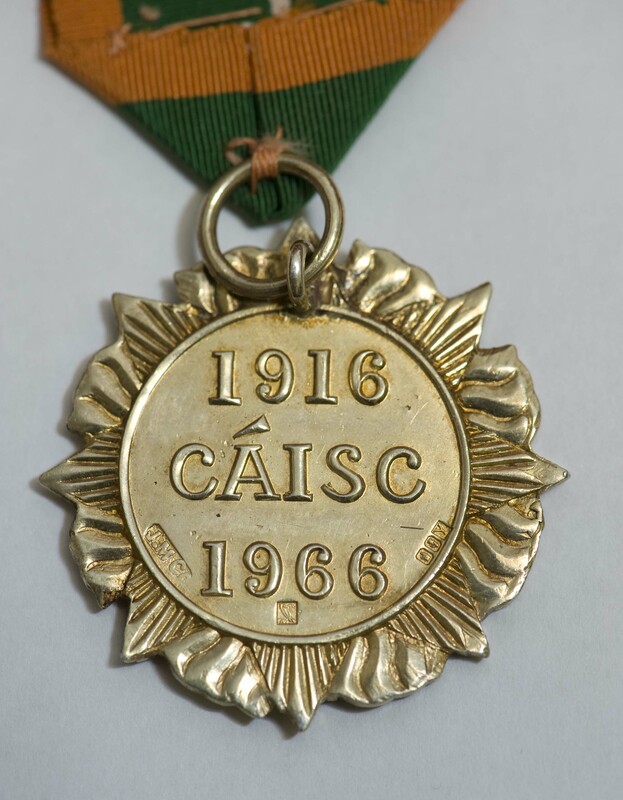 This is a very big issue to cover as the uniform, appearance, personnel, weaponry targets and tactics of the Irish Volunteers / I.R.A. 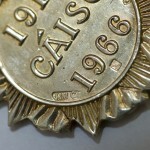 changed hugely between 1913 and 1923. 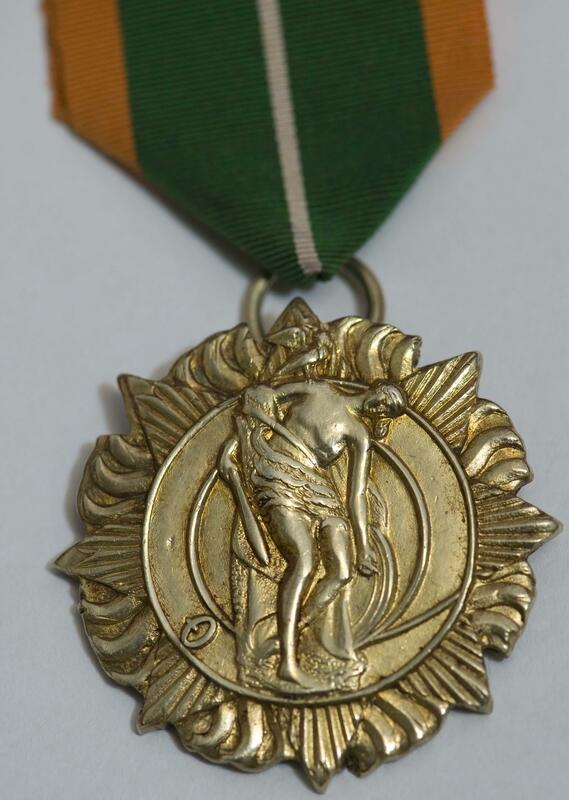 (Basically we should look at the period as three different conflicts 1916 – The War of Independence – Civil War) Few republicans in the period ever owned a formal republican uniform ie, hat tunic belt etc. Usually they wore civilian clothing with a lapel button or badge, a uniform hat and a uniform belt with military equipment. Coupled with this is the fact that rebel armies rarely if ever manage to get any sense of uniformity in their uniforms. 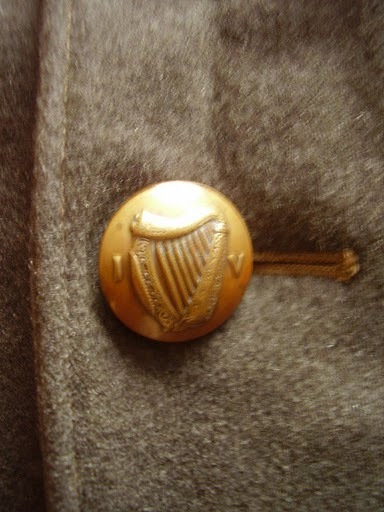 However uniforms were important in the period for propaganda reasons to those who saw themselves as being the legitimate army of Ireland – having a uniform gave them an extra sense of legitimacy. Most estimates place the number of uniformed republicans who took part in the 1916 rising as between 1/4 to 1/3 or the whole rebel forces. I must stress that for the purposes of re-enacting the period it is far more important to have a good set of civilian clothes for the 1913 -1923 period and a licensed blank firing period weapon i.e. Lee Enfield or Ross Rifle re bored to 8-10 shotgun. 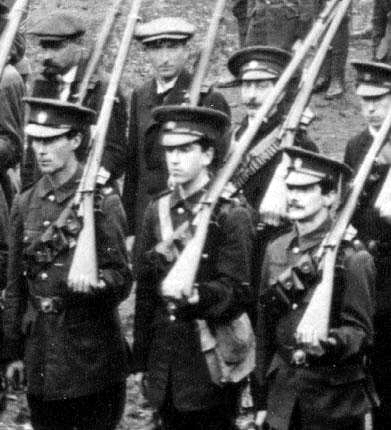 10 men with perfect nice green Irish Volunteers uniforms will be accurate for battle in 1916 – however no unit of the I.R.A. was that well uniformed in the War Of Independence – by then most republicans were far more comcerned with getting guns and ammunition not uniforms. So anyone re-enacting the period should start by getting the kit which is shown in Picture 1. This is by far the cheapest way to put an impression together as chords, tweed jackets, waistcoats and so on can be bought for practicly nothing in any charity shop. And if dosent take your fancy then every one has an old suit at home for weddings etc once its a dark colour, black, brown, grey, navy or pinstripe. However for those of you who are insistant about the Irish Volunteer uniform here it goes. This is just the first article I intend to descride the uniform in a series of articles as follows. Or something like the above any way. I will not be attempting to give the history of the organiseation in any detail. “The Volunteer Uniform. Report By Uniform Sub-Committee, 12th August 1914. Uniform Cloth; Having made exhaustive enquiries the sub-committee found that it was necessary to start ab initio. They found that no suitable uniform cloth was made in Ireland. They therefore obtained samples of a high class uniform serge from a well known English mill. From these they selected a grey green cloth of a very suitable colour for field work in Ireland. They then inquired from several Irish mills wether they could match this sample. The buisness was not keenly sought after as the mills were full of orders and the extent of the Volunteers requirements was somewhat uncertain. Finally Messers Morrough Bros. of Douglas Mills, Cork got special looms working and matched the sample. The sample they produced was submitted to experts and pronounced excellent. It was therefor decided to give the first order to the Morrough Brothers. After having several samples submitted the sub committee decided upon the cut of the uniform. 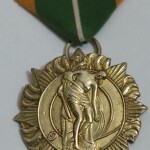 This was fixed as standard for all Irish Volunteers. The only variation to be permitted to the different regiments was in the manner of facings which were to be left to the discretion of the regimental committes or county boards. The uniform consists of tunic, two buttoned knickers and putees. 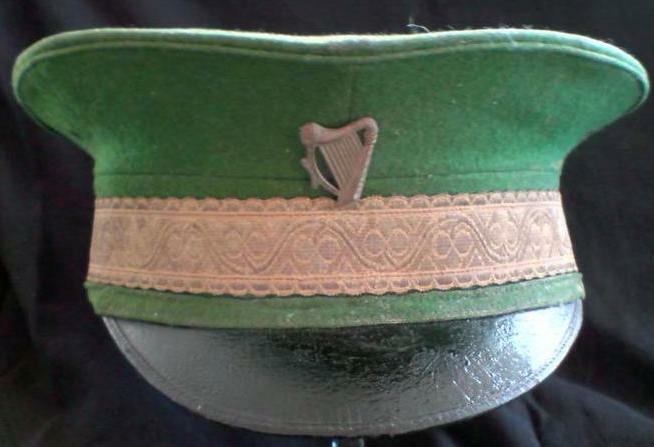 The headdress was decided upon for the Dublin regiment but was left undecided for the other regiments. A considerable body of opinion favoured soft hats but it was found impossible to get a suitable hat of Irish manufacture. The Putee presented a difficulty as the well known spiral putee is protected by patents. 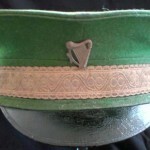 A semi spiral was decided upon and a special light Irish Serge made to match the uniform. The caps are made of Putee cloth. A photograph of this uniform (Picture 2) also dated 12th August 1914 appeared in the Irish Sword in an article by F. Glenn Thompson. 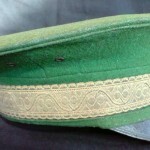 Material – the cap, tunic and breeches were of a grey green serge. There were two brest pocket seach with a box pleat and two lower large pockets on the hips. The buttons on the pockets and shoulder straps were of the same harp &IV design but smaller in size than those on the uniform front. Each shoulder of the tunic was reinforced by a patch, just Like WW1 British Army uniforms. The back of the tunic was plain. The trousers in the picture are straight and not in the bow legged jodhpurs style. Again they were made of grey-green serge. Though not shown they were presumably brown or black. The volunteer in the photo has a five pouch brown leather bandolier. A white canvas knapsack on a sling. 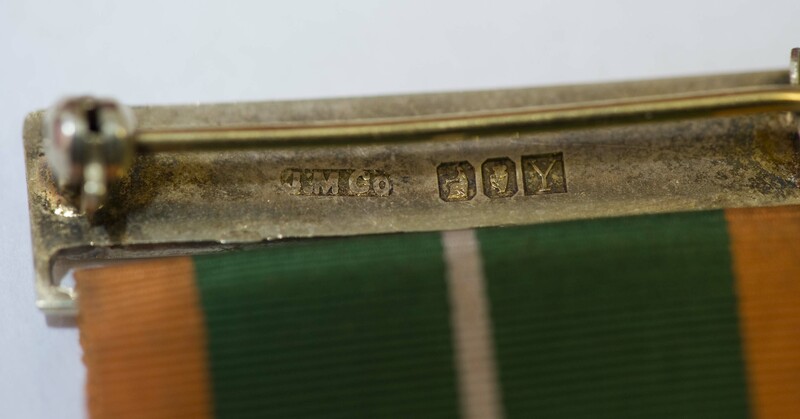 The brown leather belt with brass buckle had a harp in the centre surrounded by the inscruiption Oglaign Na h-Eireann was the official pattern (More on this and pics in a later article). 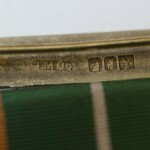 The rifle shown is a 303 Lee Metford Mk II with a leather sling which would have taken an 1888 Mark I pattern sword bayonet, worn in a scabbard and frog on the same side as the knapsack. So this was the official Dublin Head Quarters approved uniform for ordinary volunteers. Very few volunteers would have had the financial resources and been in the position to buy from an approved supplier. 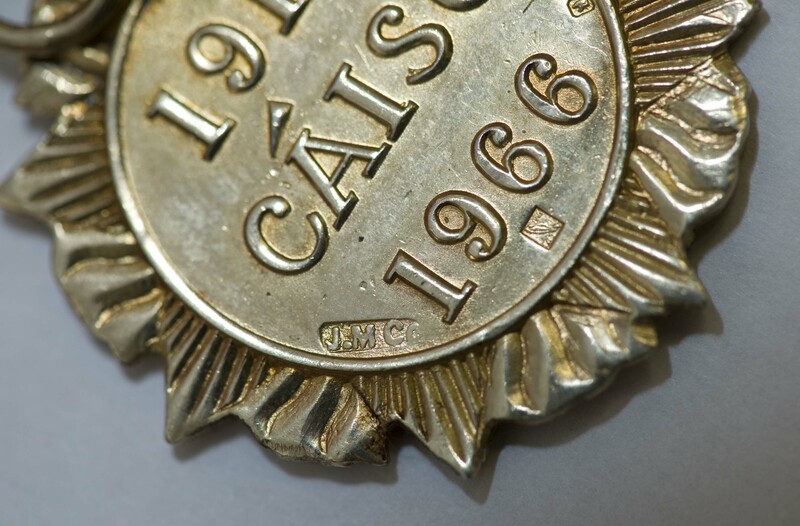 Therefore many Volunteers would have gotten their sisters or wives to make their uniform resulting in a wide variation of cuts, colours and cloths all trying to copy and approximate the approved design. Though the standard and style of uniform varied greatly this was the uniform and equipment that most Volunteers aspired to have. And re-enactors should bear this in mind when ordering / making up their own uniform tunic. 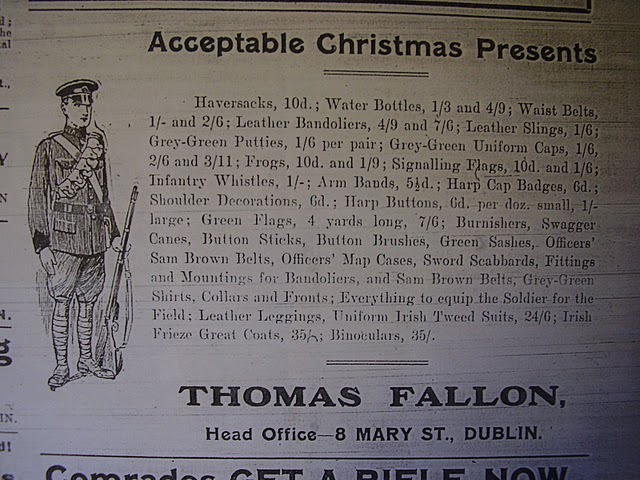 Picture 6 is an illustration of an uniformed volunteer from an advert in “The Irish Volunteer” newspaper December 1915. While the tunic, belt, cap and equipment are the same as Picture 2 the approved design – the trousers are of the jodhpurs / riding breeches style. 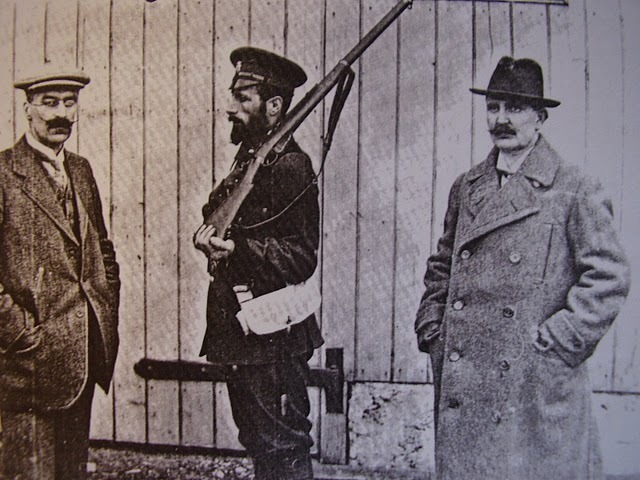 Picture 7 shows Irish Volunteer Gerald Keogh shot dead outside trinity college during Easter Week 1916. Again he is wearing the approved uniform and cap. 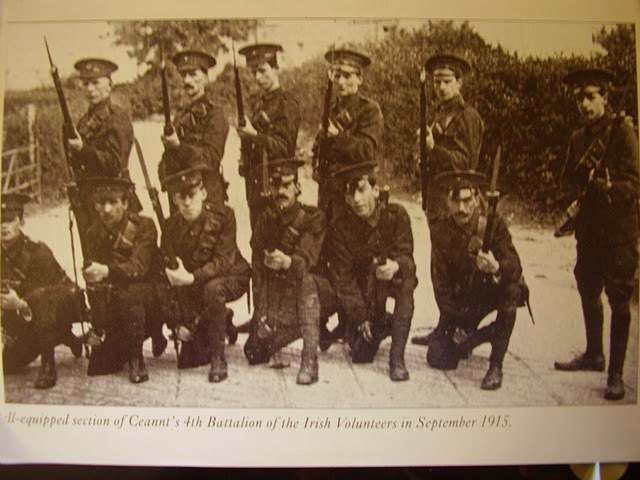 Picture 8 shows a close up of a group of Irish Volunteers on parade. Note how no two are dressed exactly the same and there is a mixture of full uniforms and civilian clothes. 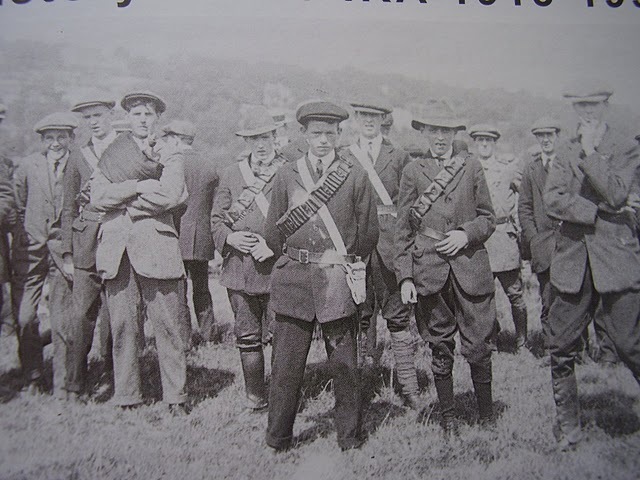 Also note both Boer War and WW1 bandoliers were in use. They appear to be armed with Italian Varetti rifles. 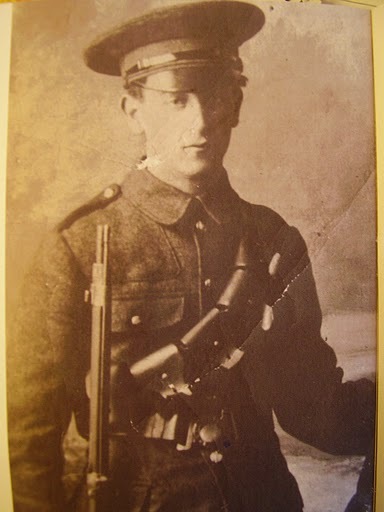 Picture 9 shows a Dublin member of the Irish Volunteers. The only piece of official uniform he is wearing is the cap. Its also interesting that he wears knee high socks over his trousers in place of putees or leggings. In 1915 the uniform regulations were changed. 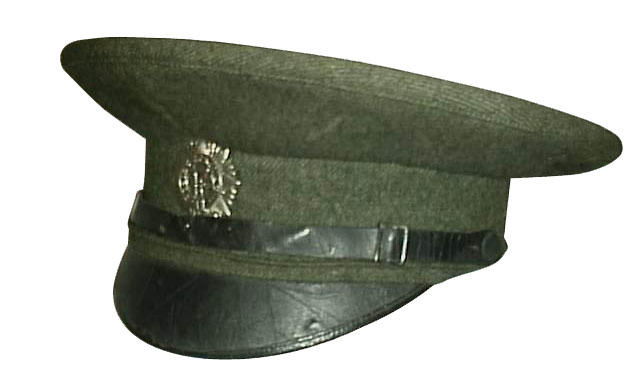 These ordered that the shiny black leather peaks on the uniform caps be dulled or covered with cloth, and that the brass buttons be oxidised brown or replaced with leather buttons. The theory behind this is that the shinier parts of the uniform would attract a snipers attention on the battlefield. Uniform regulations and styles changed rapidly again over the following years based on the availability and practicality of wearing uniforms in the years 1917-1921. I will cover this in later articles.